Consider a swim MP3 as a gift this holiday season. If you’re looking for the ideal gift for the swimmer in your life, you don’t have to think any further. There are plenty of great swim-themed gifts available at DJSports.com. We carry a vast selection of swimwear, swim gear and swim apparel so you can find the perfect option for the swimmer in your life. When you swim competitively, you go through a lot of swimsuits between the amount of time you spend in the water for practice and meets. A new Speedo custom swimsuit can be a great option if you are close to the swimmer and know his or her size. These suits come in a vast array of colors, sizes and styles so you can find the perfect one for anyone on your list. Just about everyone loves to listen to music, but how can you do this when you’re swimming in the water? A swim MP3 player can be the ideal gift for the swimmer who loves music. These players easily attach to swim goggles and are waterproof so you can use them in and out of the water. Swimmers have a lot of gear they have to take back and forth to the pool. Traditional backpacks and duffel bags aren’t equipped to handle the wet swimsuits and swim gear. Buying the swimmer in your life a new swim backpack can be a great gift this holiday season. 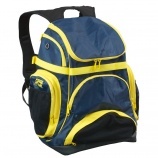 These backpacks are available in a variety of colors and styles. Swimming during the cooler months of the year can be difficult because you need to keep your body warm between meets and you don’t want to get cold before or after your swim either. 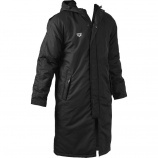 A swim parka is designed to keep swimmers warm when they’re not in the water, regardless of how cold it is outside. Another great gift option for the swimmer in your life is swim goggles. These goggles are a necessary element to successful swimming and can often wear out over time. A new pair of goggles is a great low-budget gift that will mean a lot to your favorite swimmer. You don’t have to struggle with the perfect gift for that special someone. 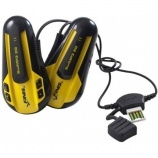 If he or she loves to swim, one of these gifts from DJSports.com can make a lasting impression. If you’re looking for the best swim gifts this holiday season, contact us. We carry a vast selection of swimwear and swim gear to make anyone’s holiday. Nutrition is just one piece of the puzzle. Swim parkas for fall can also prevent cramps. While it’s important to make sure you have the right swim backpack and other accessories, such as swim parkas for fall or swim team warm ups, it’s also necessary to make sure you take care of your body. One of the biggest problems swimmers encounter is muscle cramps. These cramps can make it difficult to swim and could even put you at risk of injury or worse. Therefore, it’s important for every swimmer to learn how to avoid these cramps, particularly through eating a proper diet. One theory regarding the cause of muscle cramps in swimmers is dehydration, which is often caused by inadequate sodium levels. It may seem unlikely to become dehydrated when you are immersed in water, but like all other forms of exercise, your body needs electrolytes to function properly. When you burn them off while swimming, you need to increase your sodium intake to keep up with your body’s demand. Keeping a good source of sodium, such as pretzels or nuts, on hand can help you replenish your body’s supply. Another great way to defeat dehydration is by drinking plenty of water while you swim. Carrying a bottle of water with you allows you to take a couple of sips between laps or races. However, water isn’t the only source of hydration swimmers should use. Sports drinks are often infused with sodium to further increase your intake so you can continue to perform well. You can also add 1/3 teaspoon of sat to a liter of sports drink if you feel you need even more sodium. While nutrition is one of the best ways to avoid muscle cramps, wearing the right gear can help. Another theory on the cause of cramping is cooling off too quickly after a workout. This is why most swimmers purchase swim parkas for fall swimming meets and practices or wear swim team warm ups at practices and meets. This will keep your muscles warm longer and slow down the cooling process to prevent cramps. Muscle cramps can be a sign of a more serious condition and shouldn’t be ignored. Instead, it’s important for swimmers to learn how to prevent them to ensure safe swimming. Proper nutrition, including staying hydrated and increasing sodium intake, can both have a positive impact on your overall health and well being. If you are looking for new swim parkas for fall or swim team warm ups, contact us. We carry a vast selection so you can find exactly what you need to prevent cramping and stay warm. A swim backpack is a necessity for carrying all your gear. As a swimmer, you have a lot of gear you need to take back and forth between the pool and your home. While you can carry the gear you need in just about any type of bag, the new Swim Stuff Pro Team Swim Backpack is specially designed to provide you with the storage you need that will keep all your gear safe and help prevent molding and other issues common when storing wet items. Whether you are looking for a last minute gift or you want one for yourself, it is important to research so you know you are getting a great deal. The great thing about the Swim Stuff Pro Team Swim Backpack is it has plenty of space for everything you need for practices and meets. This is an excellent feature in any swim team color backpack. In addition to offering more than 35 liters of space on the inside, there are plenty of pockets that are designed to hold all your swim gear, including goggles, mp3 player and more. There are even specially designed wet pockets to hold your towel and swimwear when you are done using them at the end of a practice or swim meet. One of the best features you need to look for in a swim team color backpack is if it is waterproof. It is obvious that you need waterproof pockets in which to store your used towels and competitive swimwear, but because the swim backpack will be located close to the pool at all times, you need to make sure the exterior, primarily the bottom, is waterproof as well so you don’t have to worry about water soaking into the backpack from outside. The new Swim Stuff Pro Team Swim Backpack comes in a variety of great colors that will match your team. This can be a good way for your team to differentiate their bags from the bags of the other swim teams that are participating. The Swim Stuff team color backpacks come in black/red and navy/gold so you can choose the one that best matches your swim team. A swim team color backpack is a necessity if you are going to be involved in competitive swimming, the Swim Stuff Pro Swim Backpack is a new option. This backpack comes in several colors and offers all the space and other storage options swimmers need to safely store all their swim gear. If you are in the market for a new swim backpack, contact us to find out more about your options. Competitive swimwear can be a great gift if you know the swimmer’s size. Shopping for that swimmer in your life can be confusing, especially if you aren’t familiar with the swimming gear swimmers need. Whether you are shopping for a friend or family member, there are many ideas that will allow you to find the perfect gift that is useful. These three items make great options for the novice swimmer to the more experienced. Competitive swimwear is something swimmers need to replace on a regular basis due to the wear and tear they undergo. Even practice swimwear must be replaced regularly. If you are close enough to the swimmer to know her size, you can buy her a great swimsuit, such as the Nike Static Attack Spider Back Tank. This incredible swimsuit offers the full coverage and compression she needs to make her body more hydrodynamic. This suit is available in four different colors: green, royal blue, purple and red. It is essential to have a special swim backpack in which to carry everything swimmers need from home to the pool and back. These backpacks are specially designed to hold wet items, as well as keep all the small gear you need to succeed in the water. If you are looking for a great swim backpack to give someone for Christmas, the Speedo Pro Backpack has everything swimmers need. Available in 19 colors and color combinations, you can find the perfect one. Swimming can be relaxing, even if you are a competitive swimmer. Some swimmers do well when they listen to music as they swim. You can give the swimmer in your life the ability to listen to music while he or she is in the pool by purchasing a swim MP3 player. These players are waterproof and can go in and out of the pool with the swimmer. This is a great option for those who like to relax with some music as they practice or even swim for leisure or exercise. Finding the perfect Christmas gift for the swimmer in your life can be difficult, especially if you aren’t familiar with the sport. With these three ideas, you can find the perfect gift for those who participate in competitive swimming, as well as those who swim for leisure or even exercise. These great gift options will be appreciated by any swimmer who is serious about the sport. Carrying the right gear in your swim backpack will keep you prepared. As with any sport, the items you carry in your swim backpack can help you feel comfortable and perform your best. When you have all the necessary equipment at your meets or even your practices, you will feel better prepared and able to handle the competition ahead of you because you will feel relaxed and prepared. The swimmers backpack is an important component of the overall swimming experience. Understanding what you should carry in your bag will ensure you have just what you need. Any swimmer knows how hard the pool water is on their hair. The chemicals that are used in the water to keep the pool clean are wonderful for your health but wreak havoc on your hair. The faster you wash and condition your hair after leaving the pool, the better off your hair will be in the long run. There are a variety of shampoos and conditioners to choose from, but it is important to choose one that is made just for swimmers. Malibu C Swimmers Water Action Shampoo offers the perfect combination of a gentle shampoo with one that is meant to prevent the buildup of chlorine in the hair or those chemicals that cause green hair. After washing with this effective shampoo, it is important to follow it with the Malibu C Swimmers Water Action Conditioner to add body and bring the shine back to your hair. It might seem obvious that swimmers need towels in their bags, but the right towel makes a major difference. The perfect towel for any swimmer is one that offers extra absorbency and comfort to wrap yourself in after a long, hard swim meet. Swimmers should carry one or more towels, such as the TYR Dry Off Sports Towel, that offers the perfect balance between softness and durability to ensure longevity, even after frequent use. Every swimmer needs time to relax and unwind. Music is the best way to provide this relaxation, either before or after a swim meet. There are even a variety of MP3 players, such as the Speedo Aquabeat 2.0 MP3 Player, that can be used underwater to provide you with the rhythm and motivation you need to keep up your endurance to help you be more competitive during your meets. Carry your MP3 player in your swim backpack to ensure you always have it when you are at the pool. Swim backpacks allow swimmers to keep all their gear together. Swimming competitively brings the need for carrying many items to help your meet be as successful as possible. In order to have everything you need with you all in one bag, it is important to find the best swim backpack that is functional, comfortable and long-lasting. Each of these swim backpacks comes in a variety of colors for the perfect match. 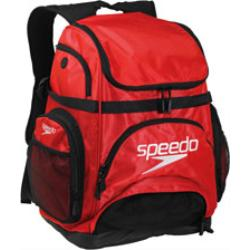 The Speedo Pro Backpack offers the performance any competitive swimmer needs. The water-resistant bottom allows this backpack to protect, even near the water. One of the most important features of this Speedo swim backpack is the wet pockets that allow you to carry a wet swimsuit or towel without worrying about damaging dry items. With a large number of pockets and ergonomic shoulder straps, you can stay organized and stylish with this Speedo backpack. The Nike Team Swim Backpack offers a stiff bottom that keeps the bag upright, preventing its contents from spilling out, while also providing the water proof bottom to allow you to put the bag as close to the water as you need while competing. The mesh pocket gives you the option to store your wet items away from everything else in your backpack. With a special compartment for shoes, sunglasses, cell phones and keys, you will be able to stay organized so you can focus on your big swim meet. For the swimmer who needs a companion that allows you to put everything in its place, the Swim Stuff Swim Backpack is perfect. Whether you need a place to store your swim shampoo or goggles or a way to keep your wet and dry clothes separate, this backpack can handle it all for you. 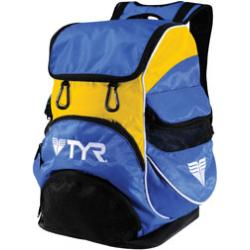 The TYR Alliance Team Backpack 2 is designed just for swimmers with its two carabiners to hang suits and mesh compartment that encourages suits to dry quickly. With two separate compartments for wet and dry clothes, everything will stay safe in this swim backpack. With a dedicated pouch for goggles, MP3 players and various other pouches, competitive swimmers will love how organized and efficient they feel at their swim meets. The Arena Team Backpack is perfect for swimmers on the go. This swim backpack features a separate compartment for all your wet items, padded shoulder straps and a water-resistant bottom to best fit all your needs. The main compartment is large, allowing you to carry everything you need to the pool. Organization is also easy due to the small side pockets, perfect for storing all your small necessities. A swimming backpack is essential for any swimmer. Arena is one of the big names in team swimming. This is why they have taken the time to design a swim backpack that will fit your needs. With a section for your wet suit and towel after the meet and a water-resistant bottom, you don’t need to worry about getting everything else wet. The padded straps ensure your comfort as you head to and from the pool. If Nike is your brand of choice, the Nike swimming backpack has a large, waterproof bottom that allows the backpack to sit up on its own for easier access. The mesh pockets allow you to store your wet items after the meet. Other great features in this bag include a section for your shoes or other footwear, a pocket for your cell phone and one for your sunglasses as well. TYR offers two different swim backpacks that will provide you with everything you need to transport your swim gear from home to the pool and back. If swimming is just part of your talents as a triathlon star, the Transition swim backpack provides you with the room you need for all your gear, from your swimsuit and goggles to your bike helmet and running shoes. If you don’t need space for all these items, the Alliance team backpack 2 may be a better choice. This backpack features pockets for your wet gear, as well as an mp3 player. to make it easier to transport your swimming gear to and from your practices and meets, you don’t need to look too far. Many of the biggest names in swim gear make backpacks that have separate pockets for your wet gear after you are done swimming, as well as your dry clothes and shoes while you are in the pool. Even if you compete in triathlons, you can find a backpack that will meet all your needs.